An Nebrius ferrugineus in uska species han Orectolobiformes nga syahan ginhulagway ni René-Primevère Lesson hadton 1831. An Nebrius ferrugineus in nahilalakip ha genus nga Nebrius, ngan familia nga Ginglymostomatidae. Ginklasipika han IUCN an species komo nadudultan. Waray hini subspecies nga nakalista. ↑ 1.0 1.1 "Nebrius ferrugineus". IUCN Red List of Threatened Species. Version 2012.2. International Union for Conservation of Nature. 2003. Ginkuhà 24/10/2012. ↑ 2.0 2.1 2.2 2.3 2.4 2.5 2.6 2.7 Compagno, L.J.V. (1984) FAO Species Catalogue. Vol. 4. Sharks of the world. An annotated and illustrated catalogue of shark species known to date. Part 1 - Hexanchiformes to Lamniformes., FAO Fish. Synop. 125(4/1):1-249. 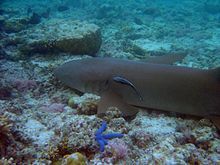 ↑ 3.0 3.1 3.2 Fricke, R. (1999) Fishes of the Mascarene Islands (Réunion, Mauritius, Rodriguez): an annotated checklist, with descriptions of new species., Koeltz Scientific Books, Koenigstein, Theses Zoologicae, Vol. 31:759 p.
↑ Smith, J.L.B. and M.M. Smith (1963) The fishes of Seychelles., Rhodes University, Grahamstown. 215 p.
Ini nga pakli kataposan nga ginliwat dida han 14:01, 13 Oktubre 2014.